ADDvantages is one of the greatest avenues I have found for my child, which is why I have been with them nearly three years! My child has made so much progress that we keep signing up for programs, they have so much to offer. They have a knack for finding ways to make learning fun, so my child actually looks forward to her sessions! There is not enough room on this paper to list all of the changes and improvements that has occurred since working with ADDvantages. My son has shown improvement across the board, he is more confident, inquisitive, and focused. 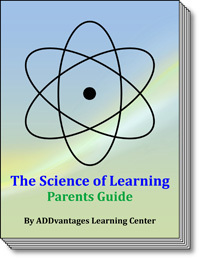 My child has shown specific improvements during the weeks at ADDvantages Learning Center. It is easier to get him to do things which was a struggle in the past. The greatest change is reflected in his overall "spirit". He is "lighter" and I hear him laughing more. I interpret this as a decrease in his frustration level and things in general are easier for him He also has become more verbally expressive with me. After trying just about everything and being frustrated with my son's frustration, we found ADDvantages. Immediately we noticed our son enthusiasm, just be a little success, that grew all the time. His memory sharpened, desire to keep going increased, logic and reasoning started to connect by realizing he wasn't dumb, but just needed some assistance in unlocking some things in his brain that was already there. I just loved working the program and have recommended ADDvantages to many of my friends whose kids are struggling. Struggling in school really lowers their self-esteem, but this has boosted my sons. He has also taught me as a parent. I wish we could have found ADDvantages earlier in his age. He is doing great! Jessica biggest improvement was actually in math. She dreaded homework and math class but now has much more confidence. She has had much more success in math with her teacher reporting a willingness to keep at a difficult problems and working through them. Her pace of work has doubled. She now independently does her homework withing an hour! Before it would take three hours and we'd cut back the work. Her teachers have all reported better completion of work in class. I have recommended this program to other parents and I tell them that there is a parental commitment, but when the program is over, they'll be happy the invested the time. Before Katie began the program she was having difficulty completing assignments and staying focused and on task. We began to see improvements in the 3rd week. After the 4th week the teacher called us to let us know that she had made significant improvements. Katie made the honor rill her last marking period in the 4th grade. She also has better comprehension than ever before and has become more social as well. At home I saw a big change with the ease of doing homework. I have already referred a few friends to ADDvantages. I only wish the school would see the same. I feel confident about the program and am continuing with another one. Amazing trainer, great match for Yael …. very positive all the time! There is hope with ADDvantages' programs. 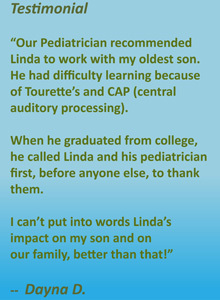 Learn about our Assessment and how this first step can help you, your child or loved one experience success. Get Started and Book your Learning Consultation-Assessment Today. Feel Like a Giant in the Workplace and a Midget at Home? How Can I Get My ADHD Child to Clean His Room?